Are beans healthy? You bet—and they’re not just for chili and schoolyard bathroom humor anymore, either. They’ve been elevated to powerfood status. Beans can be the superstrength behind any diet because the high fiber and protein help keep away hunger. Plus, if you swap out a meat dish with a protein dish a couple of times a week, you’ll help knock out some saturated fat. So that makes beans great diet foods, but what makes them powerfoods? Turns out, these protein-packed wonders have some secret superpowers. Here’s your field guide to the major benefits packed in six different kinds of beans. “Beans, beans they’re good for your heart.” When they came up with this song, they must have been thinking of navy beans. 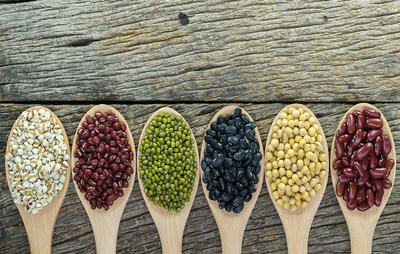 Navy beans have the most cholesterol-clobbering fiber of any bean at 10.5 grams per 100-gram serving, plus tons of potassium. In fact, a study published in the Journal of Nutrition found that a high-potassium diet helped people lower their blood pressure more than just limiting salt. (We recommend tuna from Wild Planet or Vital Choice). If sugar is your villain, let garbanzo beans come to your rescue. Also known as chickpeas, garbanzos are high in fiber, which helps stabilize blood sugar, lowering the risk of type 2 diabetes. Garbanzos can be eaten whole and added to salads and soups. Mash them and you have the main ingredient in hummus. Hummus comes in a variety of great flavors and can be eaten spread on crackers or used on sandwiches as a healthy swap for mayo. Always look for a hummus that uses olive oil—or better yet, make homemade hummus. In the battle against cancer, lentils are the champions. Women who eat lentils frequently have a lower risk of developing breast cancer, says a study in the International Journal of Cancer. Other studies show that lentils may protect against prostate and colorectal cancers as well. Start your day off right with this egg with braised lentils and greens dish. Kidney beans and chili go together like Superman and red capes. But this chili staple also contains more antioxidants and omega-3 polyunsaturated fatty acids than any of its bean brethren. Importantly, omega-3s have been linked to better cognitive outcomes in older adults. Plus, kidney beans are highest in thiamine, a nutrient that may be protective against Alzheimer’s disease. If you use canned beans instead of cooking your own, we recommend using a brand like Eden Foods that doesn’t use cans with BPA in the lining. Every team of heroes has the supergenius behind the scenes, and in this bean team, that would be the black bean. Great in everything from burritos to soup, black beans are full of anthocyanins, compounds that have been shown to improve brain function. We recommend The Healthiest Burger Recipe Ever (+ A Delicious Side). Technically a legume, soybeans are one of the only common plant foods that contain complete protein—meaning all nine essential amino acids. This makes them terrific muscle-building meat substitutes for vegetarians and meat-eaters alike. From edamame to tofu, there are tons of easy ways to enjoy soy. Just be sure to eat soy in moderation and to always look for organic—otherwise, you could be eating genetically engineered soy, a food that’s never been tested for its long-term impact on human health. Try Curried Tofu with Asian Slaw for a meal boasting 19.4 grams of protein.